What Are the Top Bluffing Games? Everyone who's ever played a hand of Poker knows how important it is to be a good bluffer. That skill will also help you win these games, some of our favorites. Published by Milton Bradley / Endless Games / FX Schmid. 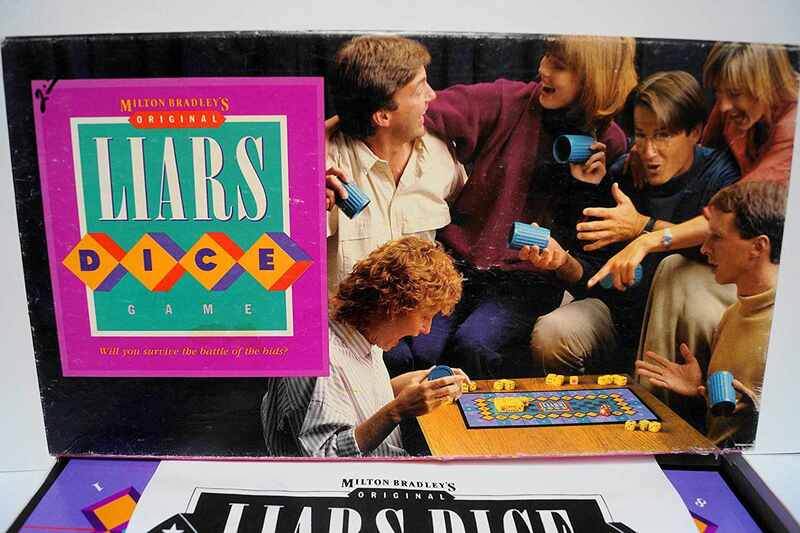 Perhaps the ultimate bluffing game, Liar's Dice challenges players to look into the eyes of their opponents and make outrageous claims with complete confidence. On a turn, a player predicts how many of a particular number has been rolled on all of the dice around the table—but he only knows what's on his own dice. For 3 to 8 players, ages 8 and up. Designed by Alan R. Moon and Bruno Faidutti, published by Gryphon Games / Schmidt Spiele. Players dig through mines, trying to find gems while avoiding dangers like cave-ins and explosions. Incan Gold (previously published as Diamant) is all about managing risk—should you leave the cave with the gems you have, or should you keep digging for more? Taking big risks can win you the game, but it can also assure a last-place finish. For 3 to 10 players, ages 8 and up. Designed by Frederic Moyersoen, published by Z-Man Games. Dwarves are mining for gold, working together to find the best path to make sure they can get the gold back to the surface and divide it. Unfortunately, some of the dwarves might be saboteurs, looking out for themselves instead of the group. After three rounds of digging for gold, the player with the most is the winner in this card game. For 2 to 6 players, ages 10 and up. Published by Uberplay. Collecting sets of antiques is the goal in this family-friendly game. Each turn includes two rounds. In the first, all players simultaneously decide whether they're going to the castle or the auction house; in the second, they decide what action they'll take in the building they chose. It's best to pick a building and action that no other player chooses. Adel Verpflichtet won the 1990 Spiel des Jahres, Germany's award for Family Game of the Year. For 4 to 8 players (best with 7 or 8 players), ages 10 and up. Designed by Yasutaka Ikeda, published by Z-Man Games. In my experience, this interesting board game never fails to entertain. Players are randomly and secretly assigned to one of three groups of characters (shadow, hunter, or neutral) and try to survive until the end. Players work to figure out who is on their team, and to achieve victory. For the hunters, victory means killing all of the shadows. For the shadows, victory means killing all of the hunters or killing three neutrals. The neutral characters each have unique victory conditions. For 2 to 6 players, ages 12 and up. Designed by Laura Robinson and Paul Toyne, published by Mattel / Parker Brothers / Schmidt Spiele. In this party game, the player whose turn it is reads a little-known word, and everyone else writes down a definition that at least sounds possible and turns it in. All of the definitions, including the correct one, are read, and players vote on which they think is correct. Every vote for your (fake) answer earns you points. For 4 to 6 players, ages 10 and up. Published by Repos Production / ​Asmodée Editions. Players are all criminals trying to divide the loot from a robbery. Players simultaneously point their guns at each other and are then given a chance to run away and avoid wounds—but doing so also means they won't share in the loot. Adding to the tension is the fact that one player is an undercover cop trying to notify the police to raid the gang's hideout. Cash 'n Guns takes about 30 minutes per game. For 2 to 5 players (best with 5 players), ages 8 and up. Designed by Alex Randolph, published by Ravensburger / Winning Moves. This is a simple game to understand, but not so simple to play. Each player begins the game with an identical set of cards. They bid on scoring tiles (positive and negative), but they have to be pretty good at guessing how their opponents will bid to win. Raj was also published as Beat the Buzzard, Catch Up!, Hol's der Geier and Mini Hazard.